Does solar work in Bellingham? The short answer is yes, depending on what your definition of the word “work” is. Solar panels convert solar radiation into electricity. The energy is measured in kilowatt hours (KWH), the same unit used on your electricity bill (10 bulbs of 100 watts burning for 1 hour equals 1 KWH) Most folks use grid tied PV – the power is fed directly into the electrical grid, and used by the house, with no batteries. The benefits of grid tied are simplicity, low cost, and low maintenance The down side is that if the grid goes down you have no power (because there is no way to store it). 1. Do the panels actually produce electricity in rainy, cloudy Bellingham? 2. Are they cost effective? Discounting weather and local shading, every place on the planet gets the same hours of sunlight in a year – in the arctic it’s all during the summer, in the equator it is spread evenly throughout the year. The amount of power that is developed by a solar panel depends on how much sunlight is hitting it, for how long, and how efficient the panel is at converting electricity to energy. Some of the best data on how much sun comes our way is here, at the National Renewable Energy Laboratory. Bellingham is about half way between the north pole and the equator (48.7597 deg lat). We have long clear days in the summer, and short dark ones in the winter. Luckily, most of the clouds and drizzle come when our days are short and our sunnier weather comes when our days are long. In an average year in Bellingham, a panel set at 34 degrees and facing due south would get 3.8 kilowatt hours per square meter per day on its face, or about 3.8 kwh per 10 square feet per day (thanks, NREL!). For comparison, Phoenix AZ gets 6.4 kwh/10 sq ft/day. Fairbanks AK gets 3.4. Another factor in solar energy generation, though, is temperature. Solar panels are more efficient when they’re cooler, so we gain some ground on our comparison to Phoenix with our relatively cool sunny summer days. In the end, though, with the same size and type of panel, you would generate much more power in Phoenix than you would in Bellingham. So…does it “work”? Yes, but not as well as if we lived in Phoenix. The other part of “work” is being cost effective. To me, that means that the project should pay for itself in less than 15 years. Our 100 square feet of panels, set at 34 degrees and facing south, would get about 3.8 kwh of sun per day averaged over a year. However, the real amount that is generated for your use at home (after taking into account inefficiencies at the panel, inverter, and line) can be roughly estimated at a tenth of that, or about 0.3 kwh/10 sq ft/day. To simplify, that means that in Bellingham 100 square feet of solar panels could produce about 3 kwh of usable power per day, averaged over the course of a year, or about 90 kwh per month, or about 1080 kwh per year. If you are paying the utility (and thus saving) $0.10 per kwh, you would theoretically save $108 per year by installing 100 sq ft of solar panels and generating 1080 kwh in a year. At $5,000-$7,000 per kw, that is a payback of 46 to 64 years. The path to cost effectiveness is in the rebates. 1. Installing solar panels and an inverter that are both made in Washington State will net you $0.54 per produced kwh, up to $5000 per year. 2. Until June 2013, there is a 100% State sales tax exemption on projects of 10 kw or less. 3. If you are in Whatcom County and go through the Community Energy Challenge, there is a $3000 rebate and a very low interest loan. 4. And, last but certainly not least, there is a 30% Federal tax credit for installing solar electric. I highly recommend the Department of Energy website DSIRE, a thorough and easy to use database of incentives for solar and alternative energies. 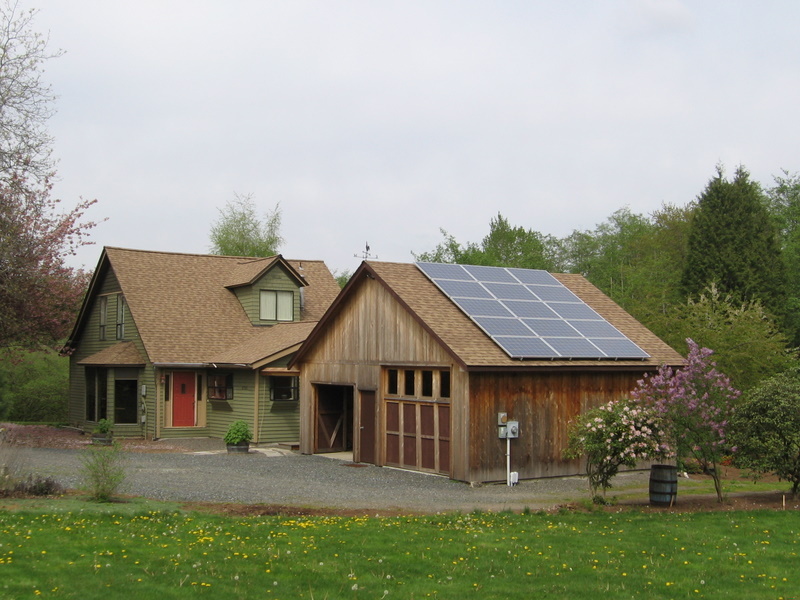 So lets say that you install a 6 kw system in Bellingham, and it costs $36,000 all told (6 kw x $6000 per kw). You generate 18 kwh per day averaged over a year. It covers about 600 square feet of your south facing roof. You go through the Community Energy Challenge and take the low interest loan. You pay no sales tax. $3,000 from the Community Energy Challenge. $3,500 payment from the State for power that you produced. Which means that your $36,000 solar project came down in price to about $18,000, which you can pay off at a couple of hundred bucks a month with a low interest loan. And next year you’ll get another $3,500 payment from the State plus free electricity. Your home is also worth more – approximately $36,000 more, according to a study by Lawrence Berkeley National Labs. Your payback is now about 5 years not counting your increased home value. Thanks to solar ace Dana Brandt at Ecotech Energy for his help with this article!